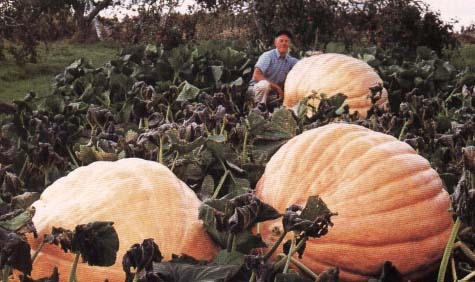 DILL'S ATLANTIC GIANT is the grand-daddy of all giant pumpkins. The present day record, for this variety is an amazing 2009 lbs (913 kg) and it is common for the variety to produce 400- 500 pound (180-230 kg) fruit consistently. Used mainly for fall fairs and International pumpkin competitions that are becoming increasingly more popular around the world. Also perfect for huge jack o'lanterns and fall displays! Fruit colours, vary from yellow to orange and the skin is slightly rough. Days to maturity-130. Pumpkins prefer a location with full sun, sheltered from the wind. Soil pH of 6.5-7.0 is recommended. Soil should also be deeply tilled, high in humus and have adequate moisture. Fertilizer, fed in abundant and balanced amounts, will produce gigantic-sized specimens. Get a head start on spring by starting the seeds indoors in 4" peat pots about 2-3 weeks before the last spring frost or plant 2-3 seeds in each hill after last spring frost date. Space hills 15-20 feet apart. When plants are 3-4 inches high, thin to one plant per hill. Choose the strongest, healthiest plant. After the first pumpkin Is set, remove all other fruit which may appear during the course of the growing season. For more information, see Don Langevin's How to Grow Books".